Smart Converter - The Story of a Hit App! Last week we released our new free video converter - Smart Converter. Smart Converter is a multi-purpose video converter that we decided to make free. We figured that everyone needs a good converter sometime, and if you just want to do single conversions here and there, we're happy to let everyone have this for free. Smart Converter went live on the Mac App Store at 8am (Perth time) on Thursday 7th July 2011. Within 16 hours Smart Converter shot to the top of the free app list in the Video Category for most countries, and was making a charge on the top free app overall. Within 48 hours of launch, Smart Converter was the top free app in all major countries except the USA where it remained in spot number 2. The US took a lot longer to crack the top Free App spot, but we finally got there 72 hours after launch. We've passed a bunch of popular free apps along the way including Twitter, Evernote and Kindle. Smart Converter has an average 4 star rating around the world with ratings and reviews increasing by the hour. Smart Converter is a video converter that uses our own video tools and FFmpeg to convert videos from one format to another. There are many free video converters on the App Store and available for general download, but these apps are just simple user interfaces over FFmpeg. These apps just call FFmpeg in the background wihtout applying anyy smarts to the conversion. Smart Converter does a lot of checking of your video and the output format that you have chosen before doing any conversion. It then does a highly optimised conversion when its ready. This is where it gets its 'smarts'. Smart Converter includes an ad display system that displays an ad while conversion is underway. We are using this to promote Smart Converter Pro and other Shedworx apps. We are developing Smart Converter Pro right now. It would have been nice to have it ready now, but we decided to get Smart Converter out there now, refine our conversions, then release Smart Converter Pro. We will continue to improve our conversion engine behind Smart Converter and the free version will always include the same fullly-functional engine as the Pro version. Smart Converter Pro will include batch conversion capability, no ads, and more control over the actual conversion process. Its been an exciting ride so far! 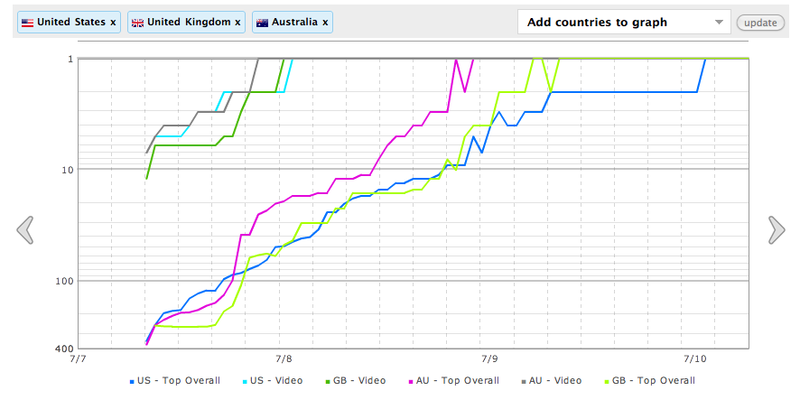 Our daily install rate is still increasing so I think Smart Converter will keep top spot for a while yet. Thanks to everyone who has installed Smart Converter so far! If you haven't, grab it now - its free after all. The Mac App Store is 6 months old today, so let's look at what's good and bad about it. There is no doubt that the Mac App Store is a winner for consumers. Multi user licence - I can buy once and install on all my Macs. This will save me a lot of $ over the years. Single point updates - I can update all my apps from one point. Easy purchasing - every software developer that I bought stuff from had a different payment process. I hate putting all the details in every time I want to buy something, not to mention the security risk of deciding every time whether the payment site they are using looks OK or not. With the Mac App Store it's all linked to your iTunes account and you don't even need your password if you've set that to be remembered. Based on how the Mac App Store has worked for me, I don't think it will be long until an independent software developer will only be able to sell via the App Store. The exception to this is the kinds of apps that Apple won't list, like network monitors, downloaders and things like that. The user experience is excellent and it's just plain cheaper than the old way. Add to that the safety factor of knowing these apps are Apple Tested and the App Store is a winner. Licence lock down - Apple has never locked down it's software to a single machine. You install any app as often as you like and the software will just check that only one copy is running at any point in time. This worked well for companies that ran software infrequently but on many machines. This is no longr possible. Also, borrowing your friend's copy of iLife to upgrade you system won't happen any more. You have to buy it yourself! Special Apps - a whole class of apps will never make it to the App Store. You will have to buy these apps separately which will become annoying as most of your apps will be managed via the App Store. I bought a new MacBook Pro earlier this year so I thought it was a good time to check out the Mac App Store and see how it helped the laptop setup process. I run a fairly common computer setup with an iMac for home and a laptop for work. I upgraded OSX to the latest version on both machines and purchased all the apps that I have been using for a while. I had already purchased the apps the old way, but I was going to need them all on the new laptop, so I needed to buy them again anyway. The best thing about the Mac App Store from the consumer perspective is that every purchase is a "family" licence where I can install the software on all my Mac computers. I've got 3 Macs now, and that will only grow so this is a big plus. On to the migration. I ran the Mac Migration Assistant from old to new laptop (over AirPort) and 16 hours later was done. All the App Store apps were there and I just needed to re-enter my iTunes password the first time I ran each one. Too easy! Now all three of my Macs have the same set of custom apps which I can update with the click of a button on the App Store. At Shedworx we didn't jump straight into the Mac App Store because we were getting ready for our trip to MacWorld and finishing off Cosmos. We also wanted to try it out for ourselves to see how it worked. We tried it out early on and decided to jump right in. 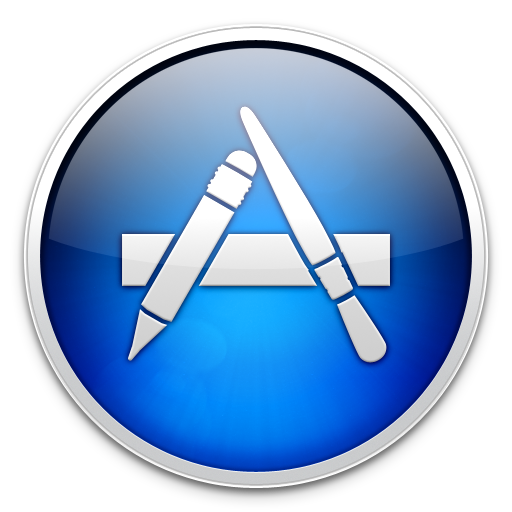 Today all of our Mac apps, except Jaksta and HD Quick Look are listed on the Mac App Store. Jaksta - requires admin access to listen on the network interface for downloads. Jaksta's big technical strength is it's abilty to run outside of any application and pick up any download entering your machine. Requiring admin access is outside of the App Store guidelines which is fair enough. The full version of Jaksta will not ever be able to run on the Mac App Store. Discovery. It's a big world out there. It's hard to get noticed for some of our smaller apps. Our less popular apps have seen a big sales improvement since going on to the App Store. Purchase. The purchase process on the App Store is second to none. We can never make it as easy as Apple does when it comes to buying. This results in more sales. Testing. Apple actually tests your stuff. Apple picked up a couple of bugs we had missed when putting up our apps. We fixed them and they're live now. Support. We get almost no support emails from our App Store sales. This is because Apple has conditioned customers to not expect software support. It's making our life easier! There are some negatives to the App Store. No bundles. It's no secret that we want you to buy the Shedworx bundle rather than just one product. We don't have any ability to upsell to a bundle on the Mac App Store. We can still use in-app promotions to highlight features of our other apps though. No customer details. We run a mailing list where we send out news, run the occasional survey and generally try to understand our user base better. This is all gone with the Mac App Store. Apple owns the customer and as a developer you will never know who they are. As a software developer we have to come up with other ways to find out what is going on. Impact on regular sales. As soon as the Mac App Store opened we saw a reduction in sales from www.shedworx.com. Since listing on the Mac App Store we have more than recovered these sales. This makes Mac App Store listing mandatory for us and I'm sure all the other software developers are finding the same thing. There is one thing I haven't put on the Cons side which most other developers list. It's the 30% Apple commission. I havent listed it because I see this as a cost of using their store. They handle all payments, reduce support and provide us with a new customer base that would possibly never get to our site to find software. The Mac App Store is great way to buy apps. The ease of purchasing, peace of mind and multi-seat licensing making it a real winner compared to the old way of buying apps. There is anecdotal evidence out on the web that a large percentage of people don't buy software from anyone but Apple. If this is true, the App Store will open up a huge new market for small software companies like Shedworx. There are a few restrictions about what can be sold on the App Store which hold back some developers. These restrictions will force us to look at our apps in a different way to make sure all our stuff can get into the App Store and get in front of millions of potential new customers. The AVCHD Format Co-Promoters (the owners of the AVCHD Format) have just released an update to the AVCHD Spec that covers 3D, Progessive and 3D Progressive. Panasonic started shipping 3D cameras using 'side by side' encoding in 2010 and Sony joined the 3D race in March 2011 with Full HD 3D which means two video channels are used (instead of side by side recording). The Sony approach uses a 50i or 60i video stream capturing 25 or 30 interlaced frames per second, per side. AVCHD now supports a true 3D mode, but until we see the new spec we don't know whether the official AVCHD 3D mode will be side-by-side, Full HD or both. Panasonic again was first with this format to the camcorder market and now Sony camcorders support 50p and 60p shooting. We have supported Panasonic 1080/50p and 1080/60p since last year but now we'll have a spec to see exactly what is going in with this videos. This one is new to us. We will have to see the spec to know what this is all about, but we're guessing it's 3D 50p and 60p support, so that each video channel (one for each eye) is a progressive video stream. It's good to see AVCHD finally formalise the 3D and Progressive video formats which have been shipping for over 6 months now. We have to go through the paperwork now to get licenced under the new AVCHD Spec, then we will check out how it all works. Once we have access to the official AVCHD spec we will post another update. We've just released a major update to Cosmos on both the Mac and iPhone/iPad. Current owners of Cosmos for Mac can get the update via Auto-update or you can download it here. Cosmos for Mac is now also available on the Mac App Store for the first time! Cosmos for iPhone and iPad can be updated from the iTunes App Store. Improved Photo support - all Photo metadata is now captured by Cosmos on Import, and key details are displayed in the Information panel. Improved Information display for all assets - you can now see more info about your assets in the Information panel. Notes - you can now add Notes to Albums to help you keep track of what the photos or videos were taken of. Import Fixes - Fixed a number of bugs around large scale imports. Cosmos has now been tested and verified against batch imports of up to 10,000 assets at a time. Sync Reliability - We have fixed a number of bugs around how Cosmos behaved when going in and out of the background. Cosmos is now a lot more reliable when you start and stop it. This upgrade has also required us to upgrade the CloudSync system. Those of you using the CloudSync service will have to switch to the new version of Cosmos OSX and iOS in order to run against the upgraded CloudSync. Your Library will have been upgraded on the Cloud. Final Cut Pro X is here! Today we fired up Final Cut Pro X for the first time to see how it goes with AVCHD editing and support. Final Cut Pro X looks a lot more like iMovie than the old Final Cut Pro. On startup, you have the Event Library in the top left. This Event Library looks just the same as the iMovie Event Library that you see down the bottom of the iMovie window. The Final Cut Pro X Event Library replaces the previous Asset Browser window, so that you can now browse assets from all of your imported Events, rather than assets from the open Project only. In the bottom of the Final Cut Pro X window you have a Project browser, which is similar to the Project Browser you see up in the top left of iMovie. This allows you to open Projects from within Final Cut Pro X rather than loading each Project from the filesystem. Overall, Final Cut Pro X is very similar to iMovie in the way it deals with Events and Projects. iMovie users will find it much easier moving up to Final Cut Pro X than moving up to the old Final Cut Pro 7. FCPX claims 'Native AVCHD Support'. What does this mean? FCPX can import AVCHD video from an AVCHD camcorder. The difference this time is that FCPX does not have to convert to ProRes as part of the import workflow. Note that the import process does 'rewrap' the AVCHD video file to a QuickTime container. This means that the video and audio streams from the file are unaltered, but they are re-wrapped to a QuickTime format. A nice option on Import is the ability to 'Create Optimised Media' when importing. This allows you to convert to ProRes on the way in, if thats what you still want to do. Going to ProRes will still be important when working on older, lower powered Macs. Final Cut Pro X will still not import a stand-alone AVCHD video file. Importing AVCHD still requires access to the original AVCHD camcorder, or a valid Camera Archive disk structure. Once you get through the import process, editing is smooth and easy. No rendering is required - the AVCHD just works. We haven't done extensive edit testing yet - that will come soon. We will look at mixing AVCHD formats (e.g. 1080p and 720p) on the timeline. FCPX gives you some basic exporting options from within the application, but to do anything fancy you still need to use Compressor. Compressor is a Apple's full-featured video converter available via the App Store. FCPX now includes AVCHD DVD exporting from the Share menu. 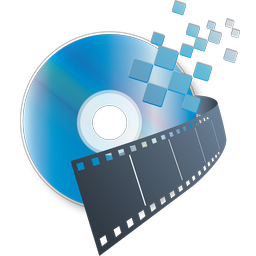 You can take a project and create an AVCHD DVD which will play back on most Blu-ray players. You can also create a Blu-ray disc, but you need to have an external Blu-ray burner for this. FCPX is now $300 US. Compressor (multi-purpose video converter) and Motion (for titles and special effects) are $50 each. No sign yet of Color (used for colour correction and tuning in video), but Color is only for Pros. That brings the new 'Final Cut Studio' equivalent to the grand total of $400, down from $1,200 for its previous version. FCPX, Compressor and Motion are only available on the Mac App Store. This is great news as you only have to buy it once and you get it on all your machines. Its not such good news if you installed Final Cut Pro across many machines under different Apple IDs in the past (not that anyone would do that). As a side note, Compressor is now available for the first time as a stand-alone app. This means that for $50 US, you can now have a top quality video converter from Apple without having to buy Final Cut Pro as well. What happened to Final Cut Express? Final Cut Express used to be $200 compared to $1200 for Final Cut Studio. With FCPX now down to $300, Apple doesn't need to provide a 'budget' version of Final Cut. At $300, FCPX is now a realistic 'step up' option for home video editing enthusiasts as well as any video editor that needs something more than iMovie. Final Cut Pro X now supports native editing of AVCHD video, but still requires you to import from a Camera or Camera Archive. If you have stand-alone AVCHD (.MTS) video files, you are stuck. You can now create AVCHD DVDs from a Final Cut Pro X project. These DVDs will play in Full HD on most Blu-ray players sold today. Final Cut Pro X contains improved, but not complete AVCHD support. Final Cut Pro X still does not support the workflow of 'Editor to HDTV playback' without going through a Blu-ray player or AppleTV (not that AppleTVs are anywhere near Full HD capable). The Shedworx Full HD playback workflow is still the best way to go straight from an edited Project to playback on a HDTV. Overall, Final Cut Pro X is far easier to get started with than its predecessor, Final Cut Pro 7. It will be interesting to see what the Pros think of it, but for the prosumer and part-time video editor, Final Cut Pro X is a winner. Panasonic was first to the home 3D camera market with its HDC-SDT750 (also called the TM750) 3D camcorder. We put up a quick review back in November 2010 and now it's time to show you how to edit 3D! The Panasonic camcorder came with some software to do importing from the camera and simple edits on a PC but, as usual, nothing for the Mac. We've updated both Cosmos and RevolverHD to take care of this. First, go and shoot some footage. Keep in mind the limitations of 3D - there is no zoom and the depth of field is quite shallow so you need to keep your subject between 6 and 10 feet away. Once you have your footage, it's time to get it off the camera and into your Mac. If you want to try this 3D game out, but you don't have a 3D camera, feel free to download our sample disk image containing 3D footage straight from our camera. You will need a Panansonic 3D TV to view the results though. There are two ways to do this - using Cosmos or doing a manual copy from the camera's filesystem to your Mac. Fire up Cosmos and plug in your camera. Cosmos will do the rest! Plug in your camera and wait for the SD Card to mount as a drive. Drill into the drive and go into PRIVATE/AVCHD/STREAM to find the video clips. Copy the whole lot to your hard drive somewhere for safe keeping, then eject and switch off your camera. Now load up your clips into RevolverHD. If you use Cosmos to import and manage your clips, just navigate to the album containing your clips and right click to 'Send to Revolver'. If you imported manually, find your MTS video clips and drag them onto RevolverHD. Once your clips are in RevolverHD you can run a preview and set in/out points to trim the clips as required. If you find some dud clips in there, just remove them from the list. Your simple edit is now complete and it's time to export. We have added a special TV Export option for Panasonic TVs to create the file structure that Panasonic requires for 3D playback. The export that you create will playback directly on the TV, straight from your USB drive, so go and find a USB drive and stick it in your Mac. Click on TV Export in RevolverHD. On the next screen select Panasonic as the TV type and select your USB Drive as the destination for your Export. RevolverHD now does its magic, trimming your clips then putting them into a structure to play back on your TV. Eject your drive and plug it into your 3D Panasonic TV. Enjoy! The process described here works just as well for regular 2D high definition video too. For quick edits and perfect quality HD playback, its a great way to go.